If you’ve been reading about autism online, you have almost certainly read that autism “rates” are on the rise. But what if I told you that here in California intellectual disability has been dropping for over 20 years? For many years the mainstay of the “autism is an epidemic” idea was the California Department of Developmental Services data. The CDDS keeps track of how many Californians are getting support under a number of specific disability categories. These data are publicly available (although not as easily available in the past), which makes them an easy source of data. It’s easy to take a cursory look at the CDDS data and think “these are official data. Look at how much autism has increased!” Or claim “the CDDS only serves “severe” autism, there’s no way they were missed in the past.” You can even find a few publications to cite to back up these observations. About a year ago I asked CDDS for some data. I hadn’t checked in a while and I wanted to see what trends are ongoing. Coincidentally, the Autism Society of San Francisco put out a report shortly after that: Autism Rising, A Report on the Increasing Autism Rates in California. So I was not alone in asking for data. The Autism Society of San Francisco made the argument that the CDDS data are accurate and show an epidemic. Births of individuals later deemed to have DDS-eligible autism have been increasing sharply every year since the early 1980s. Typically intake into the system occurs between 2 and 7 years of age. The data reflects about 200 DDS autism births per year into the 1980s, but now the system is reflecting nearly 5,000 such births per year. The drop off in cases after birth year 2008 is likely attributable to usual delay in cases entering the system, and likely does not represent an actual decrease in DDS-eligible autism cases. You can stop there and support your argument. And that’s just what most people do. Or you can question–how can I test if this is a “real” autism increase? For example, is the autism rate the same among different races? The answer is no. Is the autism rate the same in, say, San Francisco, Los Angeles, and Kern County? The answer is no. And there are many more questions one can ask of these data and over and over, the answer is no. Either we aren’t counting all the autistics in our state, or there is something much more complex going on than vaccine, toxins, epigenetics, or whatever the claimed causes of the rise are. And I’ve gone through many of these discussions over the years. Let’s make this simple then. If one claims that the CDDS counts everyone within each disability category accurately and that the definitions they use aren’t changing with time, why is intellectual disability (mental retardation) dropping so fast in California? Intellectual disability has dropped. Off about 40% of the peak value. 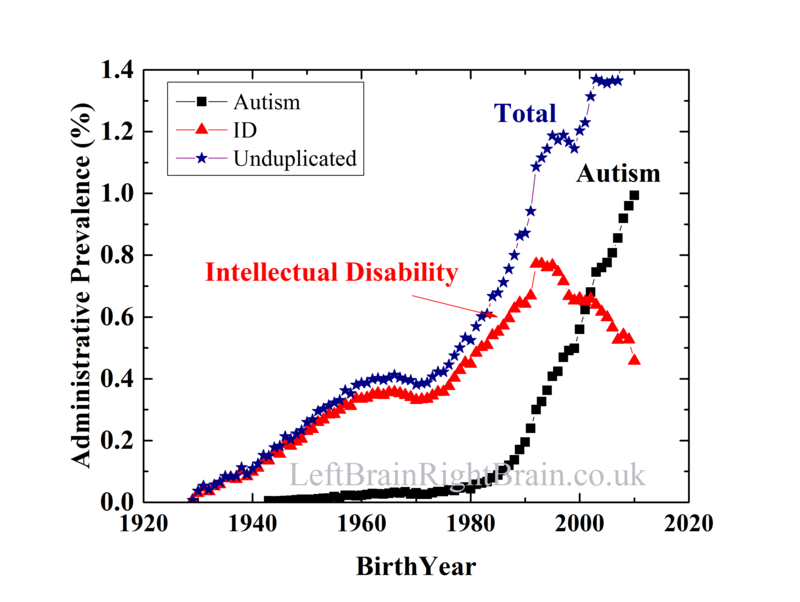 If you think your idea for the rise in autism is correct, let’s take the failed vaccine idea as an example, you need to also explain how that resulted in far fewer people with intellectual disability. Plain and simple. And none of these claimed causes of an “epidemic” can explain the drop in ID. Why bother challenging the people claiming an autism epidemic? Because it denies the existence of undiagnosed autistic adults. We have very little effort to identify those who were missed in past generations. And the likelihood is that these people–our people–are not being supported appropriately because of their misdiagnoses. And not only are we abandoning the misdiagnosed, we are failing to learn. What worked for past generations, the adults of today? What failed? What are the appropriate supports for the various needs of autistic adults? We don’t know today. And are unlikely to know by the time my kid is an adult, especially if we aren’t even looking at autistic adult needs today. And then there’s the whole autism causation question. People spending their time trying to correlate CDDS data–data clearly confounded by numerous social influences–are unlikely to ever find a real answer. But, for those who want to keep trying, include all the data. Give an explanation for this and you may be on to something. U.S. announces 2% autism rate. Again. And it’s dependent on a change in the way a survey is worded. Again. Last week a study was released showing an autism “rate” in the U.S. of about 2% (an estimated prevalence of 2.24% to be exact). Luckily one of the best science journalists out there focuses a lot of her attention on autism and covered this story. I’m writing of course about Emily Willingham and her article Increase In Autism Diagnoses Not An Increase In Autism. The study in question is Estimated Prevalence of Autism and Other Developmental Disabilities Following Questionnaire Changes in the 2014 National Health Interview Survey. The abstract is at the bottom for those interested. The results reflect a near doubling in autism rates over the past three years, but the US Centers for Disease Control, which released the data last week, says the shift is largely due to a change in the way the survey was worded. Here’s the thing, before I saw what the study was, I actually thought that the discussion was about this study: Changes in Prevalence of Parent-reported Autism Spectrum Disorder in School-aged U.S. Children: 2007 to 2011–2012. In that study, released in 2013, a 2% autism “rate” was announced. And that was a significant change from the previous survey data (using the National Survey of Children’s Health). And like previous estimates based on survey’s the change is at least due in large part to a change in the way the survey was presented to parents (I’m looking for a link to the discussion of the change in survey questions that affected the 2013 estimate, but there was a shift and it had a big impact). Thankfully much of the media, and even Autism Speaks, are pointing out how this 2% figure doesn’t represent a “real” change in autism prevalence, but is largely dependent on the study methods. Others can be counted on to shout “epidemic” and ignore some of the key reasons why this doesn’t reflect a real increase. A real increase would show up as a higher prevalence for younger kids. One thing we see is a decrease in disparity for autism prevalence by race/ethnicity. African Americans have a slightly lower autism prevalence (it’s unclear whether this is statistically significant or not), and Hispanics have a decidedly lower autism prevalence (1.49% vs. 2.55% for Caucasians). Which means we still have far to go to identify and bring services to all autistics. And it also means that the autism prevalence estimates will continue to rise as we do identify more in under diagnosed populations. But let’s focus on the important part of that–we still have a large under-diagnosed/under-served population and it is largely among Hispanics. We really need to be focusing more attention on remedying that situation. health care utilization. Parents are asked if a doctor or health professional had ever told them that their child had each of a series of developmental disabilities. Prevalence estimates of ASD, ID, and other DD for children aged 3–17 years were calculated using data collected in 2011–2014. 2011–2013 data. In contrast, the prevalence of other DD declined significantly from 4.84% based on 2011–2013 data to 3.57% based on 2014 data. The prevalence of ID did not significantly change from 2011–2013 (1.27%) to 2014 (1.10%). The prevalence of having any of the three conditions was constant across survey years. Conclusions—The revised question ordering and new approach to asking about developmental disabilities in the 2014 NHIS likely affected the prevalence estimates of these conditions. In previous years, it is likely that some parents of children diagnosed with ASD reported this developmental disability as other DD instead of, or in addition to, ASD. Following these changes, the 2014 ASD estimate was more similar to ASD prevalence estimates from other sources. Kaiser Permanente has a long history of autism research. They’ve performed a number of epidemiology studies, including many on environmental risk factors and also the recent study on The health status of adults on the autism spectrum. They have recently embarked on a large study, the Kaiser Permanente Autism Family Biobank Study. You can also find picture books (social stories) for the sample donation process on the Autism Family Biobank website. From the FAQ for the study, What is the KP Autism Family Biobank? study seeks to enroll 5,000 affected children plus their parents (for a total of 15,000 participants) to create a collection of genetic material and information for future research. Dr. Lisa Croen is the principal investigator of the study. Autism genetics has turned out to be a very complex question. There’s no single “autism gene” but autism clearly has a large genetic component. What does that mean in practical terms? We need a lot of data to understand the question of autism genetics. And that’s a big piece of what this study will do: bring a lot of data to bear. And not just genetic data. This is a key part of this study and can’t be stressed enough. Kaiser provides healthcare. They have electronic records on their patients. And these patients are the pool from which they will draw their study subjects. Or to put it simply–they will be able to not only say, “these genes are associated with autism” but “these genes are associated with autism and low verbal skills, while these other genes are associated with autism and regression.” (to give a hypothetical example). To do this they need a lot of people to participate. They are going to get 5000 autistic kids involved. And they won’t stop there: they will also include parents. That makes 15,000 participants. Not all genes are inherited. With the parents involved, Kaiser can can see if genes associated with autism are inherited or not. Now many parents will ask (and it’s a valid question), “OK, what will this do for my kid?” It takes time (not a lot, but some) to participate and lots of kids don’t like doctor visits. But consider this: genetics helps people understand biology. With a better understanding of biology, one can make progress towards treatments. There’s a reason why some of the treatments proposed for autism came from research in Fragile-X. People have spent a lot of time studying this genetic condition and that focus has led to proposed treatments. Or to put the short version of the message out–this isn’t just another genetics study. It’s bigger (15,000 people!) 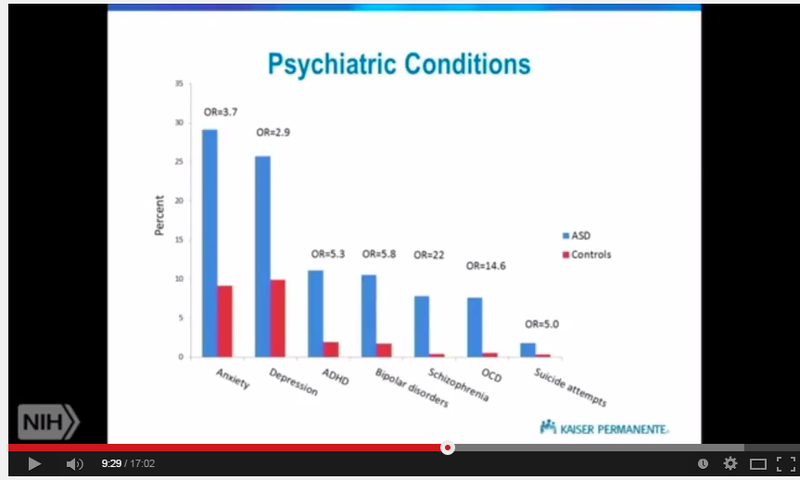 and brings a lot of value with the clinical data that Kaiser has. There’s a chance to have a big impact to better the lives of autistics. If you are a Kaiser member in the study area, please consider participating. Disclosure: I serve on a community advisory board for Kaiser. It is a volunteer position (I.e. I get no pay) and will not benefit from this study any more than anyone else in the autism community. And the decision to conduct this study was made before I became involved with Kaiser. The last meeting of the previous Interagency Autism Coordinating Committee (IACC) was a workshop on under recognized co-occurring conditions in ASD. One of the speakers was Lisa Croen of Kaiser Permanente. She spoke about psychiatric and medical conditions among adults with ASD. Much of this work (and more) was presented as a webinar at SFARI. This work was also presented at IMFAR. If you can find the time to watch the video (it’s 17 minutes long), it’s well worth it. This is the sort of work we just haven’t seen before now–a look at medical needs of autistic adults. If you don’t have that time, here are a few highlights. First consider the sort of medical conditions that get a lot of attention in the pediatric population: Sleep, GI and immune. For the pediatric population, one can watch the presentation by the Lewin group that was also given at the IACC workshop: IACC Co-occurring conditions workshop: Lewin Group presentation on co-occurring conditions in autistic children in the U.S.. In adults, GI, sleep and immune conditions are found more often in the autistic population than in the general population. Moderately more often. 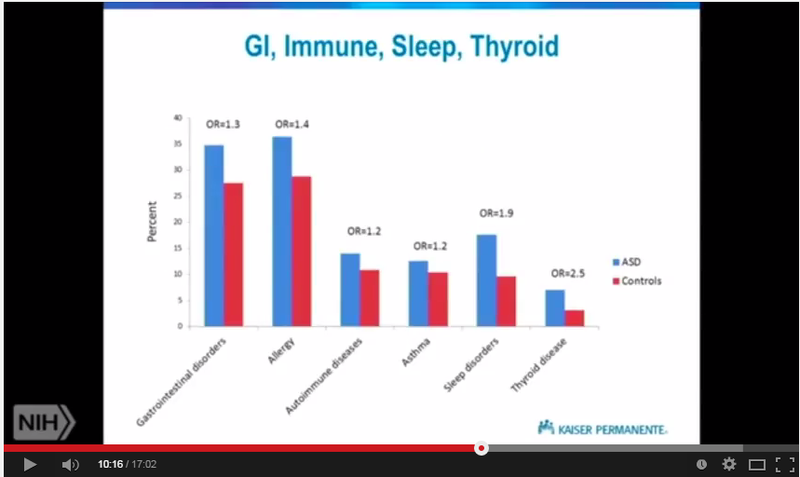 Interestingly, thyroid conditions are 2.5 times more common (compare this to GI disorders, which are 1.3 times more common). By contrast, psychiatric conditions like anxiety, depression and suicide attempts are even more common in the autistic population. Schizophrenia is 22 times more common. Neurologic conditions are also more common in the autistic population. 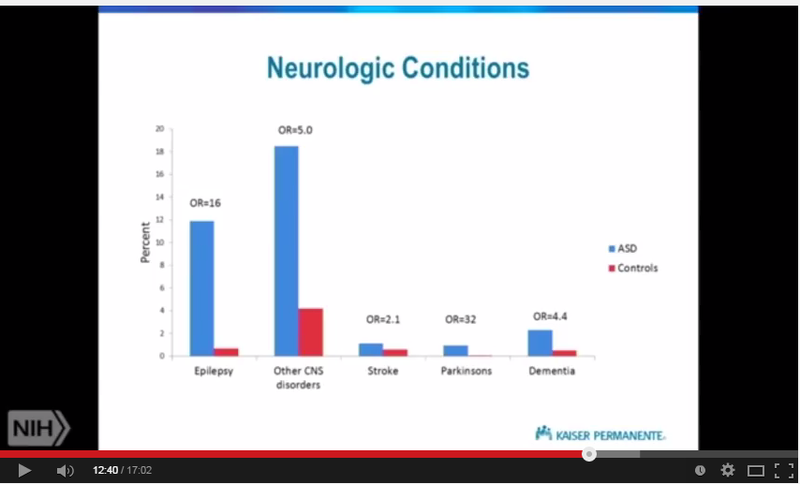 Parkinson’s is 32 times more common in autistics. Dementia is 4.4 times more common. This is the sort of work I’ve been calling for since even before I was appointed to the IACC. The autism parent community and the research community spends a lot of time talking about learning about kids and getting tools into the hands of pediatricians. But what about adults? We know that epilepsy often has an onset about puberty for autistic kids. We know that for another developmental disability, Down Syndrome, early onset dementia is relatively common. But what is going on right now with adults? What is do we, parents and autistics, have to plan around for the future? If I recall correctly, the last comment I made as a member of the IACC had to do with this study. Those are exactly the kind of things that frankly scare the heck out of me and I would like to know more about. And know there’s something on the horizon I need to know about and if there is a way to intervene with adults. IACC Co-occurring conditions workshop: Lewin Group presentation on co-occurring conditions in autistic children in the U.S.
Anjali Jain of the Lewin group presented on data they have collected from medical records about the prevalence of co-occurring conditions found in autistic children in the U.S.. This presentation was made to the Interagency Autism Coordinating Committee in Sept. 2014. (the original video is here, and the Lewin Group talk started at about timestamp 17:50. The original has closed captioning). Some of the most common co-occurring conditions are anxiety and depression. In fact, mental health conditions are found in about 70% of autistics. Similarly, neurological conditions and neurodevelopmental disorders are found in about 70% of autistics. By comparison, GI+nutritional disorders (which include areas like allergies), which get a great deal of attention, are found in about 20% of the autistic population. While large, this is much less common than the 70% rates found for mental health and neurodevelopmental disorders. Another interesting finding was that autistic children are seen more often for treatment of infectious diseases. If the risk for serious problems from infectious diseases is higher in autistic children, this makes the decision of many autism parents to stop vaccinating their children even more problematic. There are many parent advocates asking for research into gastrointestinal disorders and autism. My own anecdotal observations have been that these same parent advocates are of the belief that no work is ongoing. There are a number of projects ongoing and I’ve tried in the past to make that point (What projects are being funded in autism research? Part 1: vaccines and GI issues). I found 14 projects, nearly $3M in 2010. I found 11 projects for $1.7M in 2009. Below are the projects I found for the past few years. There are projects on epidemiology, treatment and biology. While I think that the funding agencies could do a better job informing the communities about these projects, I sincerely wish that the parent advocacy groups calling for this research would inform their members that it is going on. I am actually very curious as to why they have not done that. Brainstem and autonomic circuitry, though understudied in neurodevelopmental disorders, are implicated in pathophysiology and co-occurring medical conditions, such as gastrointestinal disturbances (GID). The goal of this R21 project is to fill this knowledge gap, based on significant preliminary data. The overall goal of our program is to (1) identify CK1 [Casein Kinase 1] inhibitors suitable for development as therapeutic agents and (2) to use these agents to investigate the suitability of CK1 inhibitors for addressing specific behavioral features of the complex, multi-symptom disorder known as autism. The CADDRE SEED studies are multiyear but I haven’t listed all the grants. So the amount is much higher than even the substantial sums noted below. SEED will address hypotheses including: ASD phenotypic variation, including the pattern of clustering of core symptoms, timing of onset, cognitive status, and presence of medical and psychiatric co-morbidities; gastrointestinal features; genetic variation and interaction with environmental risk factors (GxE); infection, immune function, and autoimmunity factors; hormonal factors and maternal reproductive characteristics; and sociodemographic and lifestyle factors. Based on compelling preliminary evidence, this project aims to explore the potential connection between GI barrier defects and altered behavior in preclinical models of autism. Our long-term goal is to explore possible serum biomarkers for ASD diagnosis, and potentially develop a novel probiotic therapy for at least a subset of children with ASD with GI issues. The life-long impairments in communication and social function are often complicated by the presence of medical comorbidities, including epilepsy, (and epileptiform discharges), gastrointestinal disturbances and sleep disorders. The proposed research is relevant to public health because the discovery of a novel function of NIBP/NFkB signaling in enteric neurons and glial cells is ultimately expected to increase the understanding of the pathogenesis of gastrointestinal diseases. It also shed light on the therapeutics for gastrointestinal inflammation and functional disorders. A number of anecdotal reports have linked autism with gastrointestinal (GI) dysfunction; most notable among these are reports that autism is associated with “leaky gut” syndrome. Microbial translocation (MT) is the process by which bacteria or microbial byproducts permeate through the wall of the GI Tract (or other abnormally porous mucosal barriers) into the bloodstream. The microbial byproducts would then stimulate the immune system, which could have secondary effects on CNS functioning, or the byproducts could have a direct neurotoxic effect. We conducted assays of MT products in children with autism (from blood and CSF), as well as typically developing children (blood samples only). Our ongoing phenotyping studies will be used to identify a cohort of children with autism who also have significant gastrointestinal symptoms in order to address this potentially important subgroup of patients.